How do you raise a teen girl to be strong? What does that mean? While physical strength is important, we’re talking about strength in character, self-worth, and spirit. Strong teen girls take action to make the right decisions when faced with difficult choices, they help others when called upon. Strong teen girls think about the world around them and acknowledge the feelings of others. Strong teen girls exhibit positive self-esteem and a positive attitude when faced with life’s tough tasks. As any teenager might, strong teen girls face moments of doubt and insecurity, but they know how to come out on top. Strong teen girls have the tools to enter adulthood and lead a wonderful, happy life. Allow her to make life choices when possible. When you see fit, allow your teen to make decisions about her life. This can be as simple as allowing her to choose what she wears or what she packs in her school lunches. What may seem like insignificant choices can go a long way in helping her develop skills for independence later in life. You can also offer choices to help her feel like she has a voice when it comes to her life and her future. Involve her when it comes to selecting extracurriculars. She may choose to abandon years of ballet classes to pursue French lessons, but trying new things will allow her to identify what she truly loves to do. Guide her towards solutions instead of immediately fixing the problem. As parents, we may see situations where we want to take the reins and solve our teen’s problem for her. However, we would encourage you to take a different approach when you can. To help your teen develop the problem-solving skills necessary to approach these types of situations, instead offer her choices. Present three strategies or possible paths to solutions. Then, discuss with your daughter how she would implement each and what the result may be. Let her take it from there. She can carry out the solution she feels fits best. And because of your gentle guidance you know it’s one that will work for both of you. 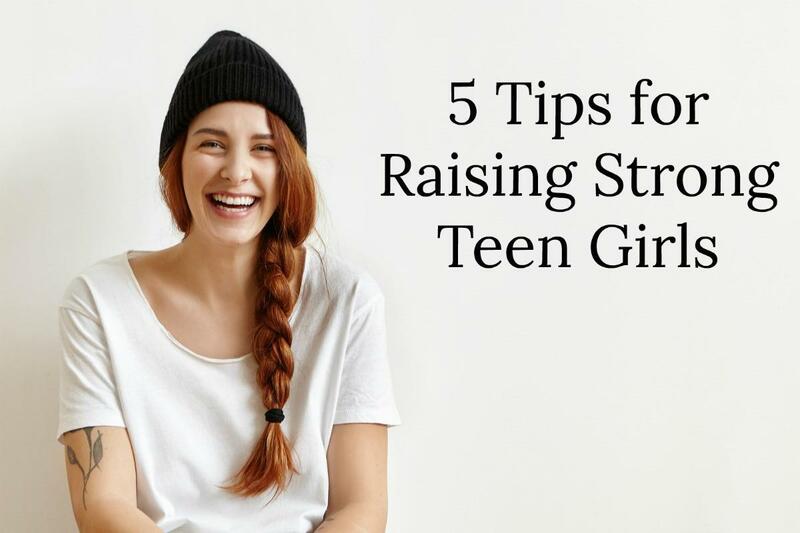 Encourage her to participate in activities with other strong teen girls. Girls who work cooperatively to reach a common goal report feelings of achievement, capability, and a huge boost in self-confidence. Offer your teen opportunities, through organizations or teams, to engage in teamwork with others. This will help her to learn important problem-solving skills, face challenges, and work well with others. Resource: Fun Activites for Teenagers by Tara Kunesh, M.Ed. Talk to her about bullying. Talk with your teen about the negative side of friendships — gossip, spreading rumors, and exclusivity — as well as physical violence. When your teen encounters exclusion or cliques, refrain from brushing it off as “mean girls” or attempting to reassure her with the quip that “girls will be girls.” Instead, bring up the strong characteristics inherent of female friendship and use personal examples when possible. Discuss ways your teen girl can effect positive change in her relationships. Listen to her when she discusses her feelings. What we experience as a conversation with our child, they might experience as a lecture. When our teens feel as though we are talking at them, they could not only choose to stop listening, but also stop working through the issue themselves – shutting down completely. However, when we choose to listen more than we talk, our teens continue to reflect and think. This open dialogue is tantamount to raising strong teens. Dismissing their feelings on one issue and expecting them to open up about another won’t work. Keep the lines of communication flowing. If you are raising a teen girl, and feel your daughter is struggling or is expressing low self-worth, speaking to a teen counselor at Doorways could be the right step for your family. If you have questions, feel free to contact us HERE or give us a call at 602-997-2880.